Most Hopeful Bullying Prevention Statistic: When friends help out, 57 percent of the time bullying stops in 10 seconds. (Hawkins, Pepler, and Craig, Social Development, 2001). One Can Count. 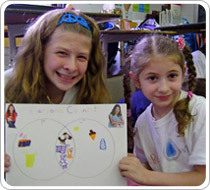 Elementary school students have the power to be their best selves, including using their unique talents and personalities to contribute to the solution. One’s messages of inclusion, empowerment, and tolerance is a simple but powerful tool that inspires students from Pre-K through 8th grade. The second book in the series, Zero, introduces the topics of building self-esteem, image issues, and finding value in ourselves and in others while continuing the message, Everyone Counts! How Can My School/Organization use One Can Count? As individual classroom activities, as a foundation for school-wide campaigns…or we found that the greatest impact is made when older students mentor younger students. When older students become the teachers, they become leaders. It creates a domino effect of leadership. What’s better than that? It is our joy to offer these downloadable materials for free because we strongly feel that teaching leadership will ultimately improve the lives of children and may even save emotional and physical lives down the road. For ideas on how to encourage your entire community to step up in affordable ways, contact us at: info@tangledball.com. We’d also like to hear about your successes in nurturing little leaders. To inquire about a visit from author Kathryn Otoshi, hosting a One Can Count workshop, or to order multiple discounted copies of One and Zero, email us at: info@tangledball.com or call 917-848-7287. Recognizing those One Can Count moments that make a difference in big and small ways is half the fun. Order MEDABO (Make Every Day A Better One) cards here. Thank you for being a ONE!